Aston Martin’s been talking about electrifying its Rapide sedan for a long while now, at least since 2017 when the V12 version of it was confirmed dead. We were told an all-electric version would be coming “in 2018.” But today, in the year of our Lord 2019, is the day we finally get it. What difference does one year make! The gas-sucking, V12-powered Aston Martin Rapide is dead. Well, sort of. Anyway, you’re looking at the production-ready 2020 Aston Martin Rapide E, the British automaker’s very first all-electric model. From its 800-volt battery system, its twin, rear-mounted motors produce a claimed 610 PS (602 horsepower) and 950 Nm of torque (701 lb-ft), according to the press release. And it’s rear-wheel drive with a limited-slip differential. I can’t wait until someone drifts this thing. It was developed in collaboration with Williams Advanced Engineering, which undoubtedly brings its experience with supplying Formula E batteries to the production-car side of things. Rapide E is powered by an 800V electrical architecture battery – encased in carbon fibre and Kevlar casing – with a 65kWh installed capacity using over 5600 lithium-ion 18650 format cylindrical cells. This bespoke battery pack lies where the original 6.0-litre V12, gearbox and fuel tank were located, with the 800V system allowing for more efficient charging and greatly improved thermal characteristics over existing electrical architectures. The range, admittedly, doesn’t seem great. Aston estimates it to be “over 200 miles” according to the European WLTP standards. But it’s a 600-HP super sedan, so I suppose I’m not too surprised. It has a claimed to speed of 155 mph, with a zero to 60 mph time of under four seconds. Aston boss Andy Palmer has said in the past that he wants the car to be able to “have usable performance for laps of Nürburgring,” so we’ll see if it can actually do that. 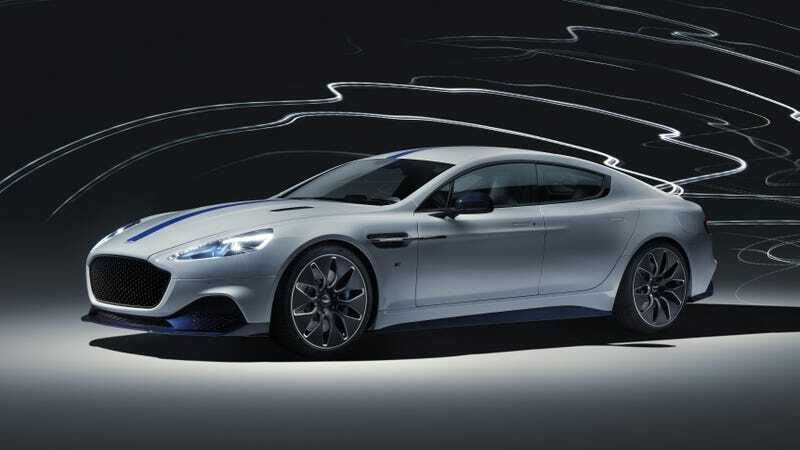 Without the gasoline engine and the necessary accoutrements that accompany it, Aston Martin’s designers were able to re-design the Rapide E’s underfloor, which streamlines airflow from the front splitter straight to its bigger rear diffuser. Because there’s no need for an exhaust system, that diffuser is now totally devoted to aerodynamics. The electric car is supposedly eight percent more aerodynamic over the gas-driven Rapide. Production is limited to 155 examples, which I also find annoying. You guys just made an all-electric super sedan! Sell thousands of them! Push for the electric future! Ugh. Anyway, no price accompanied this announcement, but Aston says that the car is available to order now and you’ll find out the price then, but we’ve previously reported it to be $255,000.